Dating platform Inivte and Meet is on the hunt for its next round of funding, and with it a way to undo the passivity of dating apps. Having grown successfully through their first stage of funding of $800,000, Invite and Meet are now out for their next round of $1 million seed funding. The funding will be used for PR, marketing and product development as the app expands to new cities like New York, Boston, San Francisco and Los Angeles. Having launched successfully in Miami the app is set found a new round of registrations in the run up to its expansion. In fact, a recent study has found that 70% of college students said that they haven’t actually met up with anyone they’ve matched with on Tinder, and that they use it exclusively for confidence-boosting and procrastination. Frustrations with Tinder gave birth to Invite & Meet which is essentially a more serious and romantic version of Tinder. The company recently announced the launch of their activity matchmaking app in Miami. Its founders discovered that connecting people based on mutual interests and having them set up a date based on those interests before any interaction takes place would instantly improve people’s chances to form real-life connections and filter out the people who are looking for a simple ego-boost. 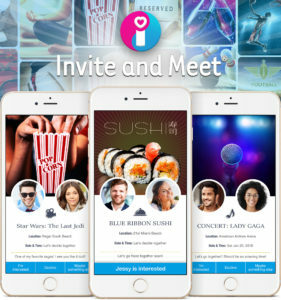 Invite and Meet encourages its users to invite each other to their favorite places, events, and activities and by doing so giving them a better chance to foster meaningful connection and make the first meetup less intimidating as the pair can focus not only on the other person, but also on the activity that both are mutually interested in. “There is no better way to develop meaningful connections or romantic chemistry than having fun sharing a favorite activity” said Alexandre Lang-Willar, Co-Founder and CEO of invite & Meet. The app shows users a list of activities that they have in common with potential partners nearby. From their the users can send and receive invites to share those activities. Once both parties express a serious desire to meet in real life the app enables the pair to start interacting on the app. The app also offers all nearby popular activities and trendy destinations, including restaurants, bars, cafes, nightclubs, movies, concerts, shows and sports events, making it an effective and simple tool to invite and get invited by strangers to experience new things in your area. Thousands of Miami locals are already using the app connecting based on mutual interests and making real-life plans. The company has recently announced the soft launch in Miami of their activity matchmaking app. The dating services industry today is valued at an eye-opening $2.5 billion in the US alone, with online services counting for 70% of the market’s value.